**GREAT IDEA FOR A CHRISTMAS GIFT!!! 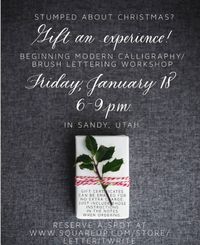 ** Join me on Friday, January 18, for a beginning modern calligraphy/brush lettering workshop! We will start with the basics and move into the entire lowercase alphabet. The cost of the workshop includes three hours of hands on instruction, a 40+ page workbook printed on premium quality paper, several pens, and treats! Tell a friend and come together, AND/OR tell the person that’ll buy it for you for CHRISTMAS! I will happily email gift certificates at no extra charge. Just indicate that you’d like one in the notes at the time of purchase. I’ve taught close to 200 people, and I’ve had nothing but positive feedback and reviews!